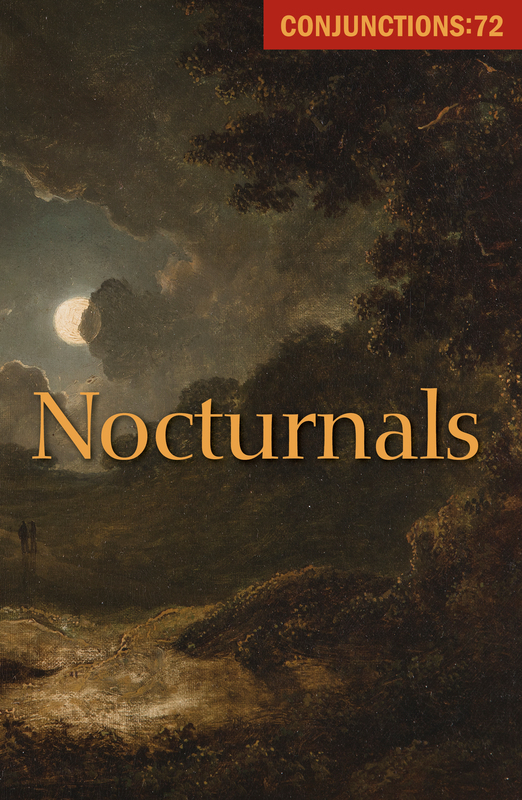 Conjunctions:72, Nocturnals gathers fiction, poetry, and essays by some of our most innovative writers, both emerging and established, on the theme of night, its denizens and its chronicles. The table of contents here is in progress and will be updated as the collection develops. For all its darkness, night can be the most illuminating time of day. Sometimes restful, sometimes restive, night is the domain of dreamers and insomniacs, lovers and thieves, prayers and despair, insights and perplexities. Just as the early bird stirs at daybreak, twilight is the dawn of night owls. Bats, cats, and whip-poor-wills are abroad after dusk, as are security guards, long-haul truck drivers, midnight cowboys, servers at the twenty-four-hour roadside diner. It’s the season of vampires, demons, and ghosts, but also of stargazers, ravers, and the philosopher who burns the midnight oil. Night is the time of noir, of tranquility, of blitzes, of moonstruck affections; the time of fugue states and nightwalkers, of sleepers tucked in bed and those headed to their night-shift jobs. Neon, candles, street lamps, and the moon are lights of the night; jazz and opera, crickets and coyotes its soundtrack. Scheherazade spun her stories for a thousand and one nights, leaving each unfinished as dawn broke, promising the sultan she would finish the story after the sun set next, thereby saving her life. Night tales can be like that—captivating, evocative, mysterious, inexhaustible, piercing the gloom with incandescence. They can be narratives of dread and dislocation, but also longing and hope. To see announcements of new issue themes or to keep up with our issues as they develop, follow us on Facebook and Twitter and join our newsletter. Cover art by James Arthur O’Connor: Two Figures in a Moonlit Landscape, oil on canvas, 1792–1841, courtesy of James Adam & Sons. To go to an issue, either click on one of the covers above, or on the issue number below.